Established: New York, in 1988, by Mark Badgley and James Mischka. Badgley born in East Saint Louis, Illinois, 12 January 1961; raised in Oregon; studied business, University of Southern California, to 1982; graduated from Parsons School of Design, New York, 1985. Mischka born in Burlington, Wisconsin, 23 December 1960; studied management and art history, Rice University, Houston, Texas, to 1982; graduated from Parsons School of Design, 1985. Before forming own company, Badgley designed for Jackie Rogers and Donna Karan, New York, 1985-88; Mischka designed for Willi Smith, New York, 1985-88. Company History: Acquired by Escada USA, 1992; introduced bridalwear, 1996; launched footwear line, 1999; opened first store, Beverly Hills, 2000. Awards: Mouton Cadet Young Designer award, 1989; Dallas International Apparel Mart Rising Star award, 1992; Marymount Designer[s] of the Year, 2001. Company Address: 525 Seventh Avenue, New York, NY 10018, U.S.A.
Starzinger, Page Hill, "New Faces," in Vogue, March 1990. "Badgley Mischka: A Single Focus," in Women's Wear Daily, 4 June 1990. Kazanjian, Dodie, "Little Black Dress," in Vogue (New York), July 1991. 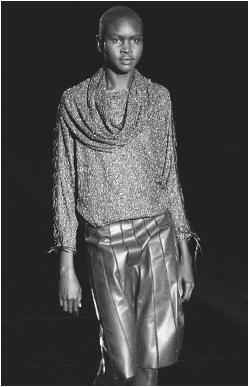 Badgley Mischka, fall 2001 collection: gold sparkle top over a leather skirt. Lear, Frances, "Relevant Dress," in Lear's (New York), September 1991. Barbee, Pat, "Glamor Boys: Badgley Mischka," in Beverly Hills 213 (Los Angeles), 21 July 1993. Friedman, Arthur, "Badgley Mischka: Into the Day," in Women's Wear Daily, 12 April 1994. Torkells, Erik, "The Night is Young," in Town & Country, September 1994. "Not Your Everyday Bride," in Women's Wear Daily, 11 December 1998. Badgley Mischka, spring 2001 collection: silver sequined gown. Boehning, Julie, "Lasting Charm: Badgley Mischka…," in Footwear News, 19 July 1999. Young, Kristin, "Beverly Hills Opening for Badgley Mischka," in Women's Wear Daily, 8 June 2000. "High Spirits…Badgley Mischka Got a Bit Lighter and Sportier," in Women's Wear Daily, 20 September 2000. Jensen, Tanya, "Badgley Mischka's Midas Touch," from Fashion Wire Daily, 30 April 2001. Ramey, Joanna, "Badgley, Mischka Honored in Washington," in Women's Wear Daily, 2 May 2001. Designers Mark Badgley and James Mischka have said of their clothing, "one zip and you're glamorous." Their clothing radiates youthful confidence; fanciful but realistic, their designs recall the elegance of an age when one dressed for evening. The two young designers, who introduced their first collection in 1988 under the label Badgley Mischka in New York, have made glamour attainable by demystifying and simplifying it. Uptown diners and downtown executives alike find something appropriate and pleasing in Badgley Mischka designs. Evening suits and dresses are refined and uncontrived—form-fitting wool jersey, cotton brocade, faille, embroidered lace, silk, and baby bouclé are used to create suits with long fitted jackets and pencil-thin or swingy full short skirts. One versatile wool jersey dress, perfect for career dressing, looks like two pieces, with a rib knit turtleneck and either a permanently pleated or straight wrap skirt, in gray or pale yellow. The combination of fine crisp and softly draping fabrics (bouclé and silk, velvet trimmed wool, organza and silk chiffon) adds dimension and drama. Fitted, empire, or lowered, waistlines are superbly shaped. Expertly mixed cocktail dresses—with evocative cocktail names such as the Tom Collins, the Delmonico, the Bacardi— are off-the-shoulder, décolleté, bowed, lacy, or beaded and above the knee. All are subtly provocative, feminine, and flirtatious. Their bridal gowns cause women to swoon, such as the V-backed ivory lace and silk-crêpe dress, or the off-white silk brocade coatdress, with front wrap and jeweled buttons. Badgley Mischka bridal dresses are for the grown-up sweet tooth, confections allowing the beauty of the wearer to shine through the frills. In July 1991 Vogue 's Dodie Kazanjian looked to six designers (including Bill Blass, Donna Karan, and Michael Kors) for the perfect "little black dress," and found it at Badgley Mischka. Frances Lear, writing in Lear's (September 1991), also chose a Badgley Mischka wool jersey as the magazine's "Relevant Dress," calling it "reminiscent of other seminal dresses, yet perfectly contemporary…as comfortable as your own skin." Such is the unerring sense of ease and balance in Badgley Mischka designs—they create something expertly vital without superfluidity or trendiness. Lilly Daché, the great stylemaker of the 1950s once said, "real fashion begins with simplicity," and Badgley and Mischka employ this manda te, creating clothing that is not only beautifully made but beautiful to wear. By the end of the 20th century the designing duo dominated the eveningwear market, and had begun to make their mark on the bridalwear. Introduced in 1996, their gowns won raves from critics, stores, and brides-to-be. In addition to eveningwear and bridal gowns, Badgley Mischka wanted to carve a niche in hip streetwear as well. While critics and celebrities crammed the runway for their opulently beaded gowns, many had little interest for the designers' more casual creations. Yet by 2000 their "tough chic" separates in colorful leather with chunky belts and bikerish cool garnered notice. Women's Wear Daily (20 September 2000) enthused, "Mark Badgley and James Mischka have lightened their touch considerably…. Hemlines rose, shapes got sportier and…though the overall effect was more buoyant, their signature sophistication remained. And it was nowhere more apparent than in the white leather-wrapped miniskirt worn with a gold knit t-shirt…and the flirty gold-accented halter dress—all of which fit to perfection." Another milestone for the designers was opening their first store, in Beverly Hills, in fall 2000. The stylish Rodeo Drive boutique featured all of their signature creations, including their new footwear collection, launched the year before. The designers had plans for additional stores in New York and Florida, and had been negotiating a licensing agreement for a signature fragrance as well. And as if several starlets wearing their wares for the Academy Awards wasn't enough, Badgley and Mischka were awarded the Marymount Designer of the Year award from Marymount University in May 2001.